It may be a few months away still, but Manchester United have an absolutely huge summer ahead of them both in the transfer market and in the dugout. Ole Gunnar Solskjaer is currently in as interim manager, and his case to take the job permanently beyond the end of this campaign grows stronger with every match. The Norwegian tactician has made Man Utd look like, well, Man Utd again, with some fine attacking football and confident play to win nine out of the ten matches he’s been in charge for. The Daily Mirror report today that Solskjaer may now be in pole position to be named United’s permanent manager over other big-name candidates for a variety of reasons as well as his own impressive stint since he replaced Jose Mourinho in December. There has been talk of Solskjaer staying on before, and the Sun have even claimed he could get as much as £200million to spend in the transfer market. One imagines some players could also be sold, with Don Balon talking up a potential move for Romelu Lukaku to join Real Madrid, which would be little surprise given the in-form Marcus Rashford seems to have deservedly moved ahead of the Belgian in the Old Trafford pecking order. Jadon Sancho to Manchester United this summer? To reinvest that huge amount of cash, a new attacker seems a good idea to start with, and the Metro claim Borussia Dortmund wonderkid Jadon Sancho, valued at around £90m, is one player on the Red Devils’ radar. In truth, it’s hard to imagine a more perfect signing for United’s right flank than the England teenager, who could form an absolutely fearsome front three with Rashford in the centre and Anthony Martial – freshly tied down to a new contract – on the left. Further back, there’s some talk of a new midfielder and that makes perfect sense given Fred’s struggles, while Nemanja Matic isn’t getting any younger. Le 10 Sport claim United are one of the clubs in contact with those close to Lyon star Tanguy Ndombele, who looks like becoming one of the very best in the world in his position. They claim he’d likely cost around £70m, but that could end up being a bargain, given the 22-year-old’s immense potential. Finally, United could also finally get that centre-back they need as the Evening Standard claim one of their top targets, Napoli’s Kalidou Koulibaly, is eager to move to the Premier League. The Senegal international is one of the best players in the world in his position and has been linked with various big moves before, with the Daily Mirror previously suggesting he’d cost around £87m to prise away from Napoli. 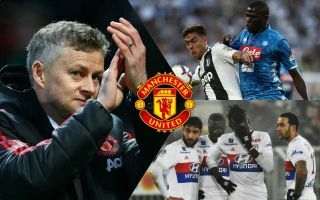 In total, that could be £247m on three new players for the new manager, and what a team Solskjaer could be leading out next season as a result!